NETWORK FINALS: Probably due to timeslot adjustment from the STANLEY CUP FINALS, SUNDAY NIGHT WITH MEGYN KELLY lost 0.3 in final numbers, while the STANLEY CUP game itself adjusted up 0.2 to 2.3. In addition, 60 MINUTES gained 0.1, while the premiere of FUNDERDOME lost 0.1. CABLE HIGHLIGHTS: TNT’s CLAWS premiered at a moderate 0.44, although it should be noted that the episode had already aired as a “sneak” after an NBA Playoffs game. AMC’s FEAR THE WALKING DEAD continued its descent, down to 1.02 after last week’s 1.18/1.04, and TALKING DEAD was steady at 0.36. Adult Swim’s MIKE TYSON MYSTERIES shed 0.02 to 0.53, and lead-out DECKER UNSEALED was down a tick to 0.29. On HBO, with THE LEFTOVERS done, the line-up’s 3 half-hours remained, as SILICON VALLEY fell 0.08 to 0.36, VEEP returned from a week off at 0.25 (up 0.06 from 2 weeks ago), and LAST WEEK TONIGHT was down 0.05 to 0.42. Lifetime’s original movie MENENDEZ: BLOOD BROTHERS was at 0.38, and the BEYOND THE HEADLINES lead-out special was at 0.24. Hallmark’s GOOD WITCH gained 0.04 to 0.28. Starz’s AMERICAN GODS, airing without a WHITE PRINCESS lead-in, climbed 0.05 to 0.26. On Showtime, TWIN PEAKS managed a 0.02 lift to 0.10, but I’M DYING UP HERE lived down to its title by holding at 0.03/120K (the episode was previously available via VOD/streaming). Note that on Comedy Central, the JORDAN KLEPPER SOLVES GUNS special (listed by the network as a STAND-UP show) was at 0.08. Sports led the unscripted side, with Fox Sports 1’s primetime WORLD CUP QUALIFIER match at 0.92 (Spanish-language coverage of the same match on Univision was at 0.54), and its afternoon NASCAR race at 0.67. On E!, KEEPING UP WITH THE KARDASHIANS gained 0.02 to 0.65, SECOND WIVES CLUB grew by 0.06 to 0.28, and the midnight WHAT HAPPENS AT THE ABBEY was down 0.02 to 0.13. Discovery’s NAKED & AFRAID rose 0.04 to 0.54. 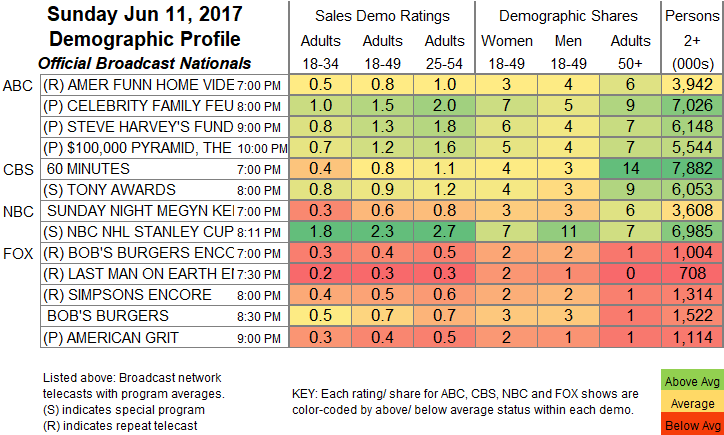 On Bravo, REAL HOUSEWIVES OF THE POTOMAC climbed 0.04 to 0.45, and INVITE ONLY CABO was down 0.03 to 0.16. On Food Network, FOOD NETWORK STAR dropped 0.06 to 0.38, and lead-in GUY’S GROCERY GAMES was at 0.27. 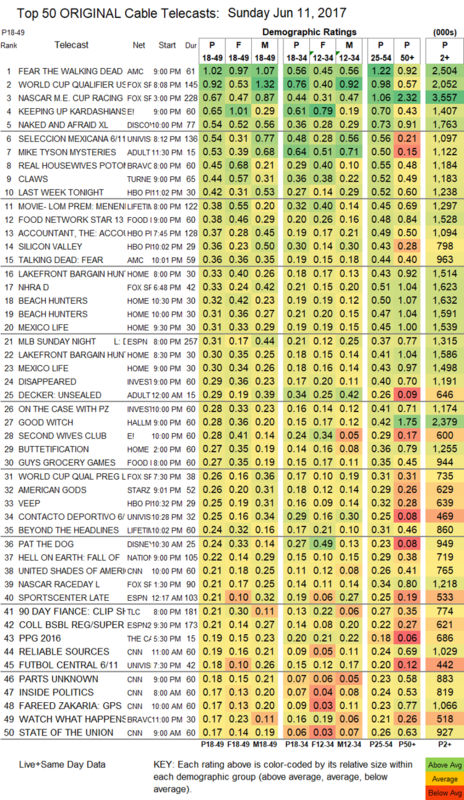 HGTV’s many shows on the chart were led by LAKEFRONT BARGAIN HUNTERS, down 0.07 to 0.33. On ID, DISAPPEARED was steady at 0.29, and ON THE CASE WITH PAULA ZAHN was down 0.04 to 0.28.